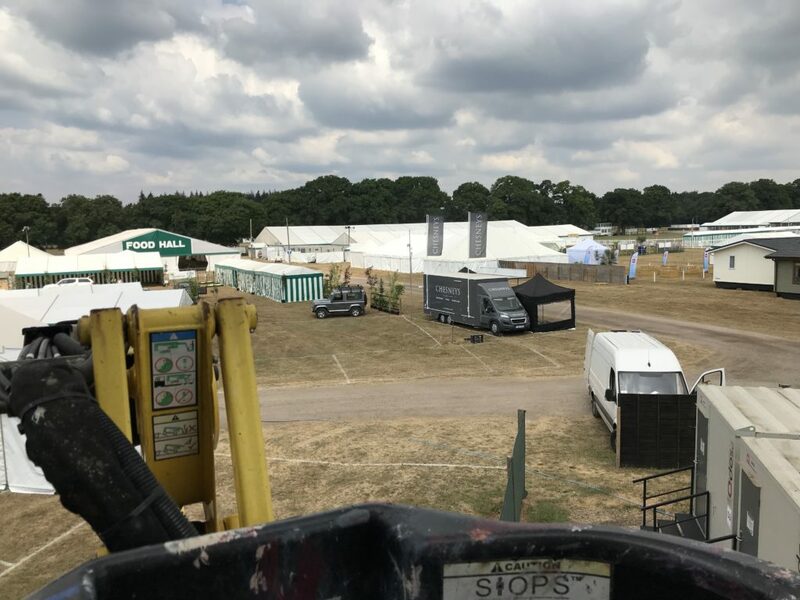 2018 saw Tech Events embark on our first New Forest Show, established in 1920 with the first show taking place in 1921, the show covering 30 acres has long established itself as one of the top county shows in the country. To cover the showground, we utilised the existing telegraph poles which are located in strategic areas around the site. Each pole was loaded with 3 Vitavox 42” horns (15 in total) and wired back to event control. The system was powered with a QSC 800i amplifier, A&H mixer and fed with a switched SM58. The system proved to be such a success that in 2019 we will be adding another 4 poles to push the sound further into the public areas. A major part of the show are the horse’s, due to the shear amount of horses at the show the horse box parking and stables take up a huge area. The area needs to be covered with PA in order to make sure the animals are in the correct area at the right time. Again, using vitavox 42” horns (18 in total) we erected scaff tube to the existing telegraph poles to gain some extra height and positioned the speakers for maximum coverage. This system needs to be fed from 4 separate arenas, so in order to avoid confusion and over talking alongside the 4 microphones we placed a monitor speaker. The two main arenas where designed identically, both consisted of 12 Evid 6.2t’s,4 Evid 4.2t’s & 6 Toa CS304’s (VIP grandstands) all erected on 10’ ali scaff poles. Each system was driven by 4 Toa VP series amplifiers and controlled by A&H mixers, they were fed with a CD/media player, cabled microphones and Sennheiser radio microphones. The systems were housed in 2 off our 12’ commentary trailers. The show jumping ring and north ring both use 12 Toa cs304 projector horns, mounted signally at 10’ high and spaced 15 meters apart. Both systems are driven with 2 Toa VP series amplifiers and fed via an Australian monitor mixer, switched Sennheiser microphones, Sennheiser radio microphones and media players. Both arenas use one of our 12’ commentary trailers. The cattle arena is split into two with our 10’ commentary trailer positioned between both. Each half can be controlled separately or linked to make one system. Both halves are equipped with 8 Toa cs154 projector horns @10’ high. Alongside the arenas are 2 traditional marquees housing the cattle. The commentary is fed into each marquee via 10 Toa PJ200 projector horns c/w independent volume controls. Once again Both systems are driven with 2 Toa VP series amplifiers and fed via an Australian monitor mixer, switched Sennheiser microphones, Sennheiser radio microphones and media players. The sheep arena is a relatively low-key area requiring 8 Toa tz201 columns, 10 Toa PJ200’s c/w independent volume controls (inside marquess), Toa VP series amplifier, small soundcraft mixer and Shure slx radio microphone. For the Heart of the forest outside demonstration area we used 2 Bosch Music horns, a Toa mixer amplifier and headset Sennheiser radio microphone. Over in the country side area we deployed 3 separate systems, Gun dog scurry, ferrets and country side arena. Gun dog scurry and ferrets were two identical systems both comprising of 2 Toa TZ201 columns, Toa mixer amplifier and Sennheiser radio microphone. The country side arena used 10 Toa TZ201 columns, 2 Toa VP series amplifiers, Australian monitor mixer, media player and 2 Sennheiser radio microphones. The Forest fun factory is a kids live entertainment area, due to the nature of the area we used an HK audio CT series System (2 18” subs & 2 double 8” tops), 2 HK audio active stage monitors, 5 Sennheiser radio microphones and a 16 channel A&H mixer. Axe men is the last arena to cover, this is a small ring doing demonstrations a few times a day. For this area we use 8 Toa cs154’s, Toa mixer amplifier and Sennheiser radio microphone.